I never would have thought that I'd feel safer at sea than I would in an anchorage, but I found myself urgently needing to escape Tyrrell Bay, Carriacou, a couple days ago. On our short 2-hour sail from Prickly Bay to St. Georges, Grenada, Skye discovered a tear in the sun cover of our foresail. Small tears need to be repaired as soon as possible after you know about them, because blowing out a sail would be both costly and a sure way to slow down a passage. So we dropped the genoa on the deck as the sun set on St. Georges, Skye pulled out his sail repair kit and sewed a neat zigzag stitch on the small tear that was conveniently located right on a seam. Austin, Skye and I hoisted the sail and re-furled it in the dark. We motor-sailed out of St. Georges before sunrise, around 0430 on Sunday morning, and by 0500 we were sailing in nice, calm winds. As we were sailing north along the Grenadian coast, Skye noticed part of the genoa rigging (foil) attached to the forestay had come apart and needed to be re-attached and tightened before we could reduce sail or put away the genoa/jib. So, we continued to sail with a full foresail and occasionally reduced the mainsail as we crossed over to Carriacou. It was our plan to stop at Tyrrell Bay to tighten the rigging, then sail on through the night past Union Island and the rest of the Grenadines. Tightening the genoa rigging requires sending someone up the mast. Whom should it be? Carla (not afraid of heights, some rock climbing experience, but perhaps not strong enough to do the tightening repair), Skye (the heaviest on our crew, the only one who has ever climbed a mast before, only afraid of heights when he doesn't have something to do), or Austin (the lightest crew member, not enthused about the prospect of climbing the mast, probably not strong enough to do the repair). Skye was elected, or self-appointed I should say. Next, do we do this maneouvre while under way in light winds, heeling about 5-10 degrees, so Skye can climb the angled mast to take some of his weight off his hoisters? Or do we wait until we are "safely" at anchor in a calm anchorage? We decided to do this maneouvre while at anchor in Tyrrell Bay, but we had hoped to arrive with plenty of daylight and we hoped for light winds in the bay. Sailing into Tyrrell Bay took about three times as long as it would have if we had motored so we arrived right as the sun set. We anchored under sail, without incident, darkness fell upon us. Skye suited up into his harness and collected his tools as the foresail flogged loudly. I saw the jib sheets (ropes for the foresail) flapping in the water and asked Aidan to pull in the port sheet. I didn't watch to see that he not only pulled in the sheet, but he cleated it off as well. More wind than expecte was blowing in the anchorage and swells were rocking the boat. Within a moment, the genoa (foresail) had filled with wind and we were dragging our anchor. At the helm, I could see our depth had increased from about 30 to 58 feet. With haste and urgency, Skye ran back to the cockpit, released the port sheet, and announced that we were going to plan B, weighing anchor and leaving the anchorage. Initially, I was disappointed and worried about having to leave the anchorage without having the repair done. However, dragging anchor in the dark, in a busy anchorage (even though we were the last boat in the bay), is really scary. Since I couldn't see Skye's arm signals in the dark, he had to call out commands as I drove slowly back towards our anchor, and back towards the entrance of the busy bay. We had anchored behind a couple large tug boats and barges, and I didn't want to get too friendly with them! Just when it felt that we were too close for comfort to one of the tugs, Skye called up that we were free, and directed me out to sea. Phew!!! I sat down heavily behind the wheel, and tears streamed down my face. It had struck me how dangerous a situation we had all been in, I was beating myself up for not paying closer attention when Aidan cleated off the jib sheet, and I was freaked out about my first night at sea, knowing I'd have to dodge rocks that may or may not be lit, as we left Carriacou. Skye captured my weeping face in his headlamp and declared with a smile (the kind that instantly wipes all my worries away) that we're all ok, then immediately shared that the anchor had picked up a piece of coral bigger than his head. He needed a hammer to remove it. Aargh! This is another thing we have been so careful to avoid until now - dropping our anchor on a reef and doing serious damage to the marine environment. Austin and Aidan dashed up to the bow to get a look at the coral head, and Skye spent more than 10 minutes to dislodge it from our anchor - bloodying his knuckles in the process. Phew! Enough excitement for me. So, with a 150% genoa and no mainsail, we motorsailed away from Carriacou, into the night. The first piece of land we had to avoid was the Sisters, a pair of large rocks off the coast. They were lit and I did avoid them, but it felt as though we passed awfully close. Next, we aimed for Union Island as Austin and Aidan crawled into their berths for the night. In preparation for this passage, I made a rule that their berths needed to be free and clear of all toys so they could be used for sleeping at any time. This proved to be an excellent rule that I intend to stick with on future overnight passages. As we approached Union Island and Mayreau, Skye prepared to go below for a nap. Since Skye installed new batteries in Grenada, we were able to use our autohelm without having to run the engine. We set a course towards Canouan and Skye left me with instructions to be sure not to get too close to Catholic Rock (Mayreau). After three months on a sailboat, Skye was finally experiencing seasickness. He remembered that it was nighttime when he was seasick when crossing the Atlantic in 1992, and he observed that he felt quite exposed in our cockpit, so open to the sea. I, on the other hand, was feeling relatively ok, having mustered the courage to get through my 2-hour watch without disturbing Skye's rest. About an hour into my watch, it was time to tack. As Skye insisted, I woke him up for the manoeuvre. 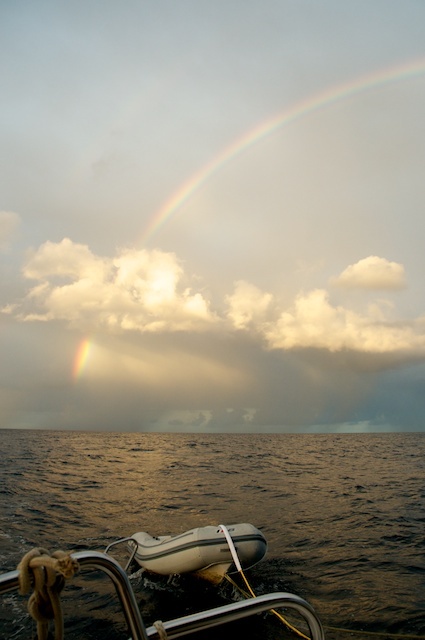 With Catholic Rock in view, we tacked northward and began a long starboard tack toward St. Vincent. Skye went down below to try to get some sleep while I had the best sightings of marine life, ever. By the light of the moon, whitecaps can really be convincing to a sleep-deprived sailor on her first night sail. I imagined humpback whales surfacing within metres of the boat, and once I was startled to spot a beluga swimming to our stern. A beluga?? Not in the Caribbean Sea! Too bad. The occasional squalls were a bit scary, as it wasn't easy to see them coming. We'd feel the wind strength increase, the boat would pick up speed as we heeled over, and we'd have to hand-steer into the wind to slow down a bit and flatten out the boat. A few times, spray would wash into the cockpit, and I'd be soaked right through. Being from B.C., it's strange to have bucket loads of warm water sprayed on me in dark and windy conditions. With rain and whitecaps, I always expected the sea water to be cold. Periodic rain squalls and sea wash certainly helped alleviate the inevitable head-nods in the wee hours of the morning, to keep the watch captain alert. We reached the southern end of St. Vincent at sunrise, but our original goal had been to be leaving the north end of St. Vincent by that time. Winds and seas were quite settled for the day, but we knew we could expect gusts as we approached the northern headland of St. Vincent in the afternoon. We had to skip a planned swing by Wallilabou (where part of Pirates of the Caribbean was filmed), and Skye and I discussed what to do about the head sail, since we would be unable to reef. Perhaps we should go back to Blue Lagoon (Barefoot) for the repair? This would set us back at least a day, and we could lose our weather window to sail to St. Lucia. I knew that Barefoot would insist on taking down the head sail ... aha! So, that's what we would do. Rather than give up on the distance we'd already made on this passage, we agreed to lower the genoa and motor sail all the way to St. Lucia. We approached St. Lucia near the Pitons as the sun set to the west, and decided to go all the way to Rodney Bay to anchor at night, rather than try to negotiate any other unlit anchorage. Seas were calm as we motored up the west coast of St. Lucia at night. The lights of Castries appeared around 9:00, and we pulled into Rodney Bay, avoiding Barrel of Beef (rocks at the southwest entrance to the bay), around 11:00pm. The guidebook described Rodney Bay as a popular destination, so where were all the boats??? Trepidaciously, we steered into the north side of the anchorage, watching our depth. We watched for shoals (shallower depths) and a good place to drop anchor. Skye was at the bow, giving me hand signals in a short white t-shirt that billowed in the wind. With his suntanned arms that blended into the night, I couldn't tell the difference between a directional indication, slow down, neutral or reverse. So, we had to fall back on voice commands, and to compete with the wind, our voices were rising and agitated (another reason we try to avoid anchoring at night - must be really annoying for sleeping sailors). As we neared the shore, boats and more boats came into view. There were many boats in the bay, only most of them didn't have mooring lights. With the shoreline so brightly lit, we couldn't see boats at anchor until we were nearly upon them! Our anchor didn't set on our first attempt, so we reset and settled down for our first night in St. Lucia. We set the GPS anchor alarm, and Skye was finally able to get some rest. He really takes his captain's duties seriously, so has been unable to get a proper sleep on passage.